Without a doubt birthstone jewelry is always a welcome gift. Why? Birthstones commemorate the most exciting time in life – your birthday and that of those you love. The personal, meaningful gift of birthstone jewelry is not only an eternal trend; it’s an expression of gratitude and symbol of life’s most precious moments. 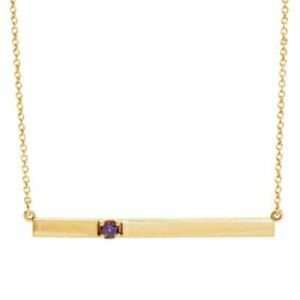 erin gallagher birthstone jewelry takes an array of dazzling forms, ranging from earrings to necklaces to bracelets. For a new mom, the jewelry of choice features her birthstone and that of her newly welcomed bundle. For a freshly minted bride, a necklace adorned with gems representing each of her bridesmaids is a piece of custom birthstone jewelry to be forever cherished. That’s not to forget festive holiday gifts. Imagine offering your best friend dangling hoop earrings dripping with emeralds, perhaps. You may find yourself taken with minimal birthstone jewelry – a simple drop earring with a glimmering diamond – that you can perfectly pair with an LBD for a black-tie affair. Other times, a bold cluster of several birthstones will spark your interest – and lots of lively conversation. Think of a Mother’s Day gift – a charm necklace graced with a rainbow of birthstones representing each of her children. 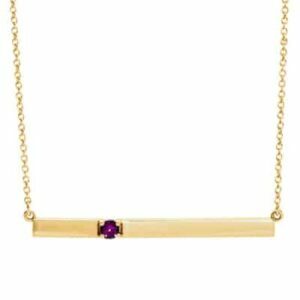 The options for birthstone jewelry are endless, and erin gallagher helps you find the perfect piece of birthstone jewelry to commemorate your most precious moments and the ones you love. Each piece is perfectly packaged in a coveted erin gallagher box, and swiftly shipped to you or your intended.